The site is under contract to an undisclosed potential buyer; public announcement planned once sale is final. Over half a city block on the border between Nulu and Butchertown has potentially found a buyer. The Service Tanks property at 700 East Main Street had been listed for $8.9 million by Tyler Smith of PRG Commercial Property Advisors. Smith declined to name the buyer or what might become of the property, but he did say the unnamed buyer has a contract for the entire Service Tanks property, which stretched from Shelby to Clay Streets. He said if the deal goes through, the new owner planned to make his or her own announcement about the block soon. “I do know that’s it’s a 2.7-acre site on Main Street,” Smith said. That scale gives any buyer a lot of clout. “It’s a big deal, yes.” Smith had previously told press that there was interest in the site from across the nation, including many out-of-town developers. Given that the unknown potential buyer plans a public announcement and the energy currently going on in the area with the under-construction Main & Clay Apartments across the street and the planned AC Hotel by Marriott on the southern corner of the block, we expect a major project to be announced on the site, likely by an out-of-town developer. Broken Sidewalk’s montage of what the AC Hotel might look like on the southeast corner of the block. Most of the site is taken up by an enormous blue warehouse that provides a monolithic presence along Main Street. We wrote about its faded blue walls back in 2008 as part of our Big Blank Thursday series. “Even though the wall casts a shadow on nearly 400 feet of sidewalk, there is something about this building that we love,” we wrote at the time. Still, we won’t be sad to see the site transformed into something much more vibrant for the surrounding neighborhoods. Rick Hill explains that while Service Tanks will continue to operate at its current site for now, someday the property will be redeveloped into a thriving pedestrian environment. 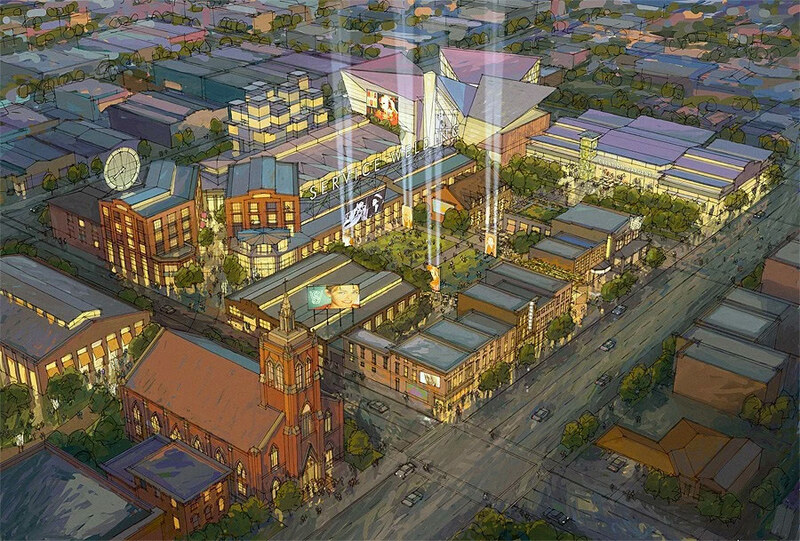 The rendering isn’t meant to suggest what will eventually be built, but is “a long-term vision of what could happen one day.” Hill says the Griers have an excellent urban sensibility and want to see the site used to its fullest potential including preservation of existing historic structures and the Billy Goat Strut alley corridor. 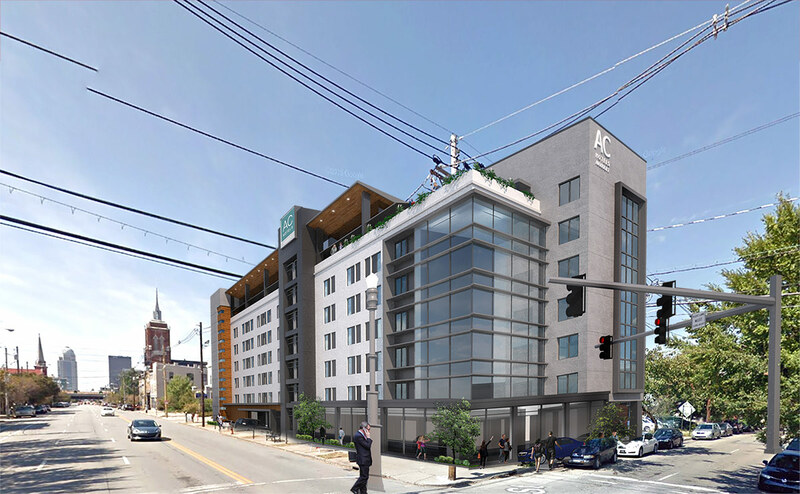 There’s currently no timeline for redeveloping the rest of the block. 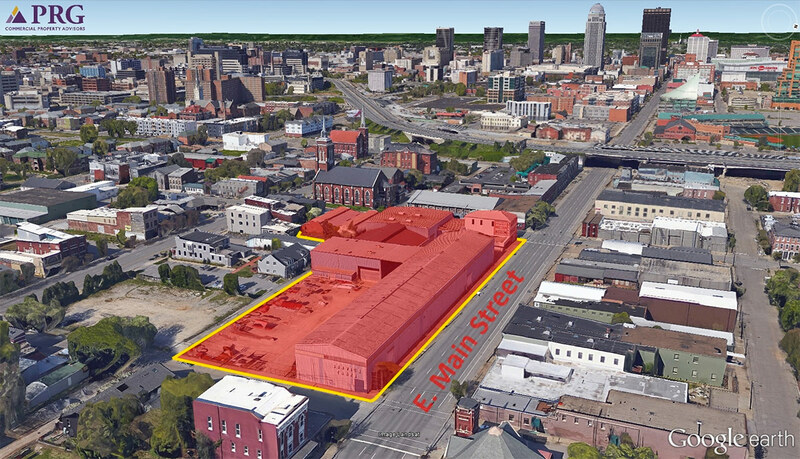 We’ll be closely watching how this deals follows through and what proposals take shape on this site and look forward to a project on such a pivotal parcel within two of Louisville’s most exciting neighborhoods. If you catch any rumors about what’s planned on this site, be sure to drop us an anonymous tip to tips@brokensidewalk.com.